Summer darts going on now! See the standings and player rankings below. Come out on Wednesdays at 6 to cheer them on. 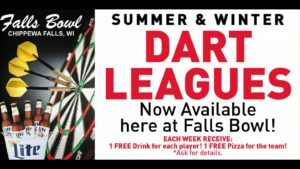 Play darts Sundays or Wednesday nights at taverns in the Chippewa Falls, Wisconsin area, including Falls Bowl! Each week receive 1 free drink for each player & 1 free pizza for your team! Whether you would like to join a team or start a new team, start by contacting us at 715-723-3347! Check back here for the league schedule and standings!